Patent Pending. GIA Item Number: 220000. With the growing availability of synthetic diamonds in the marketplace, full disclosure and confidence in knowing what you are buying is now more important than ever. 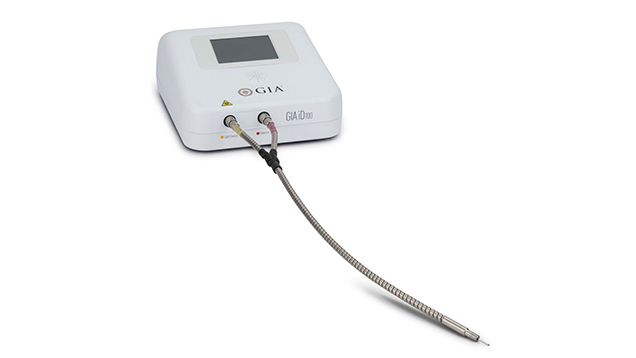 GIA has developed a sophisticated and easy-to-operate desktop instrument to screen for these stones. The GIA iD100™ combines advanced spectroscopic technology with GIA’s 60 years of diamond and gemstone identification research to distinguish natural diamonds from synthetic (HPHT and CVD) diamonds and diamond simulants. Sign up to receive updates about the GIA iD100™. Explore the features of the GIA iD100™ and learn how to use it. Download the GIA iD100™ user guide, available in multiple languages. Learn more about the GIA Melee Analysis service and how to submit stones for analysis and sorting. Decades of GIA's research efforts to understand and identify synthetic diamonds have been published in Gems & Gemology. © 2002 - Gemological Institute of America Inc. GIA is a nonprofit 501(c)(3) organization. All rights reserved.